The temple of Srirangam is situated at 10 degrees 52’N and 78 degrees 42’ E towards the southern tip of India on an Island formed by two arms of the River Cauvery. 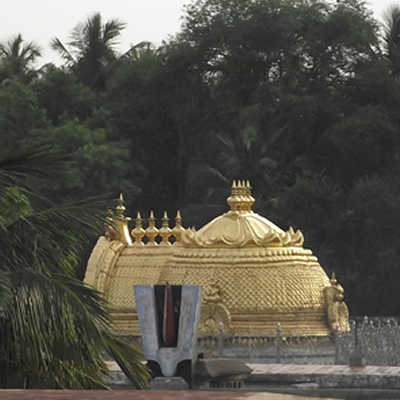 The temple covers a vast area of about 6,31,000 Sqm. (156 Acres). The temple consists of seven Concentric rectangular enclosures round the sanctum sanctorum. The temple of Srirangam is the only one in India with seven enclosures, a sacred symbolic number which for present day Vaishnava believers represents either the seven centers of Yoga, or a reference to the seven elements making up the human body, in the center of which dwells the soul. The gopuras of the seventh enclosure are unfinished. They are called Rayagopuram. The impressive dimensions of their bases prove that when finished, they would have risen to a height of at least 50.m. The sixth enclosure has four gopuras; the eastern gopura is the most impressive of all on account of its size the inscriptions in Thirteenth Century characters. The processional cars are kept in this enclosure. The fifth enclosure contains the Shrine of Manavala Mamunigal in the Chola Style. In the fourth court, non-Hindus may admire in its southern wing the Temple of Venugopala Krishnan, whose outside walls are decorated with very beautiful sculptures in high relief like young women playing the Zither (Veena) or with a parrot or putting the finishing touches (Tilaka) to their appearance before a looking glass. A climb to the terrace overhanging this temple affords a general view of the Temple of Srirangam. This court also has a museum with highly interesting objects. Non-Hindus are also admitted to the eastern courtyard of this enclosure, which is dominated by the Vellai gopura. In the south there exists the famous Sesharayar Mandapa. Opposite to this mandapa can be seen the Hall of Thousand Pillars, wherein the Statues of God and Goddesses, Alwars and Acharyas are set out for the great annual festival of Ekadesi in December and January. 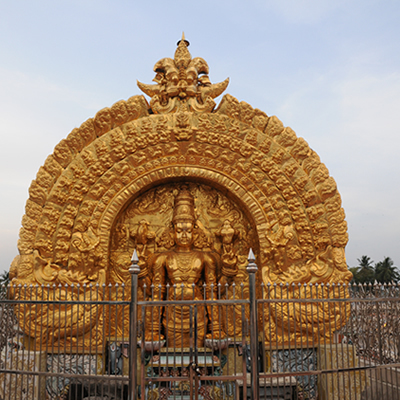 The third enclosure has the Karthikai gopura where leading to the Garuda Mandapa, which consists of 14 rows and it, is the most beautiful Mandapa in the Temple. In the western wing kitchens and rice storehouses are found. In the eastern part of this wing is the sacred tank (Chandrapushkarani), which has been hollowed out in the form of a circle with flights of steps in the east and west. The eastern wing contains several isolated sanctuaries and mandapas. The visitor at last reaches the first enclosure to which, like the second, there is only one entry, by a gate in its southern part; the Nazhikettan Gopura and on either side has images called Sankhanidhi and Padmanidhi, the conch and the lotus respectively, which are the attributes of Vishnu. To the southwest storerooms have been fitted up. Large mirrors have been placed in the corners to reflect the statue of the god when it issues from the sanctum. In the northwest corner are the Yagasala and the Tondaiman Mandapa of which ceiling is decorated with paintings of figures. The eastern part contains two Mandapas- Arjuna Mandapa and Kili Mandapa.